June 8, 2016 -- Wide receiver Jamar Howard may find himself in a Portland uniform for the third straight season, sources are reporting. 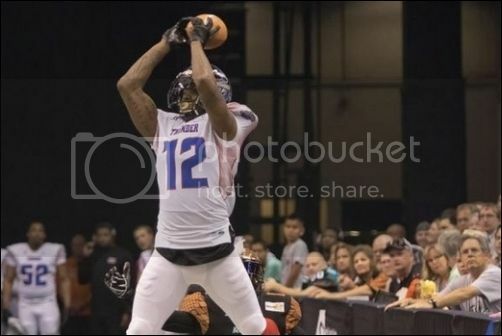 Howard, who was on the Steel's Other League Exempt list at the beginning of the season, then was traded on April 25 to the Jacksonville Sharks for defensive lineman Duke Robinson. Other League Exempt is an AFL designation for a player who is on a team's roster, but who is trying out or working out with a team in another league, such as the National Football League or the Canadian Football League. Kerry Eggers of The Portland Tribune reported over the past weekend that Howard was set to join the team. However, according to the AFL, he was placed on the Refuse to Report list on June 3. This is commonly done by teams over the course of a couple of a few days between the time a player is assigned to, traded to, or is claimed off of waivers, and the time a player reports to the team. Typically, this is done for roster management reasons. The AFL's site still has Howard listed as Refuse to Report. Through five games last season, Howard was tied for first in the AFL with 13 touchdown catches. He was second in receiving yards with 610 and third in receptions with 45. He has become the team's go-to receiver on the season, having caught at least eight passes in each of the Thunder's first four games. A leg injury in Portland's fifth game against the San Jose Sabercats sidelined Howard for much of the rest of the season. He did, however, come back for the regular season finale as well as the team's first round playoff game. He played in 11 games for the Thunder in 2014, catching 44 passes for 664 yards and 9 touchdowns. Previous to coming to Portland, he played for the Cleveland Gladiators. He also made an appearance in one game with the Edmonton Eskimos of the Canadian Football League. He caught 71 passes for 1,199 yards and touchdowns in his senior season at Central Missouri. The Steel have had a myriad of injuries at the wide receiver spot. Nick Truesdell went down in the season opener and Colt Lyerla was hurt in the team's second game. Jabin Sambrano and Rashaad Carter have been placed on injured reserve as well. Jared Perry was injured in the team's sixth game, but returned last week. Perry, Tom Gilson, Tyrone Goard and James Shaw are the other receivers on the Steel's roster. Howard could be available for the Steel as they visit the Arizona Rattlers on June 11. The game starts at 6 p.m. The Steel are coming off their first win of the season, a 68-35 clobbering of the Tampa Bay Storm on June 3 at Moda Center at the Rose Quarter. The Steel are 1-8 on the season.